Common sunflower has a larger flower with a much bigger eye. Leafcup has a maple-like leaf, while thin-leaved sunflower has a lanceolate leaf. Leaves of thin-leaved sunflower are sessile (stemless). Pale-leaved sunflower leaves have a short stem. Rays of prairie coneflower are extremely reflexed. Blossom of the small wood sunflower is smaller, and the leaves are narrower than those of thin-leaved sunflower. Leaves of thin-leaved snflower are stemless. Leaf of the thin-leaved sunflower is lanceolate, while that of tall coneflower is lobed. 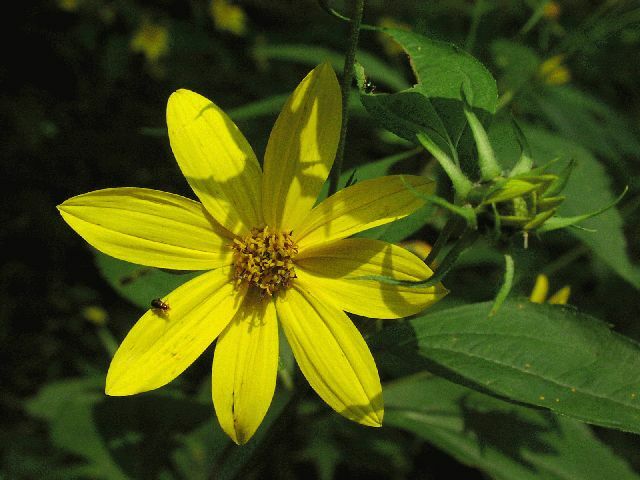 Whorled rosinweed has leaves in whorls of three, thin-leaved sunflower leaves occur in pairs or singly. These are very difficult to tell apart. Thin-leaved sunflower has a stemless leaf, while the woodland sunflower has short-stemmed leaves.